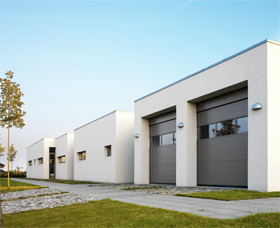 Sectional doors are often a major element in the appearance of a building, and the choice of door type, the filling, color, top- and side panels are vital to a successful result. A NASSAU sectional door allows you to design the building facade as you please. The selection of colors, models, sizes, windows and fillings gives an almost limitless number of combinations – no compromises necessary! The extra height of NASSAU 9000 sections gives a minimum of sections, which combined with the concealed joints between the sections gives a smooth, harmonious appearance. NASSAU products have been awarded the prestigious Industrial Design prize in recognition of their modern and functional design.